Lawmakers voted to shield President Michel Temer from criminal trial, at least for now. The calculus set immediate economic interests, which should benefit from the decision, against the longer-term merits of tackling political graft. Call it the net present value of shame. Brazil's President Michel Temer waves during a ceremony at the Planalto Palace in Brasilia, Brazil August 1, 2017. Brazil's lower house of Congress voted on Aug. 2 to reject a corruption charge against President Michel Temer for allegedly taking bribes, saving him from facing a possible Supreme Court trial that could have ousted him from office. 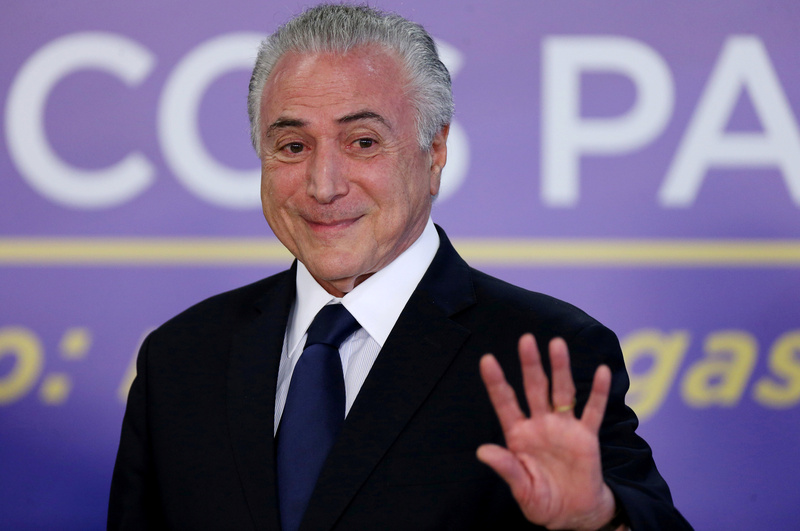 Temer won enough support to keep the opposition from gaining the two-thirds of the vote required to move the corruption case forward to the top court. The final tally showed 263 deputies voting in favor of Temer and 227 against him, while 23 abstained or otherwise didn't vote, according to a breakdown by Folha de S.Paulo newspaper. Following the vote, the president vowed to press on with pension and tax reforms aimed at helping rein in the country's fiscal deficit and restoring the economy to growth after two years of recession.